In October 2009 planning permission was granted to regenerate the 5.5 acre site at Victoria circle. The complete project will be approaching 1 million square feet, consisting of offices, retail, residential and public amenity space. There will be 3 new buildings, and extensive modifications will be made to existing buildings to transform and bring fresh life into the area. Mace has been appointed as the main contractor to deliver the £770 million project, which is soon to commence building, with a scheduled completion date for phase one in 2016, and completion of phase two in 2018. 115 million people pass through the transport hub at Victoria every year, making it one of the busiest transport interchanges in London. Due to its proximity to key transport links, the Victoria Circle is a very complex project. 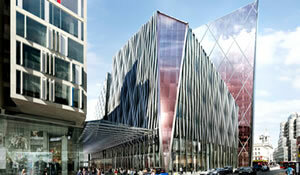 However, Mace is confident that they can deliver this extensive development for London. Armorgard look forward to working with distributors to supply products to assist during the construction of this major project, helping it to be a safer and more efficient working environment for contractors. Construction has recently started on the £650 million Airport City development, in Manchester, a 10 to 15 year construction project, designed to completely transform the area around.